On our way to Carlingford John told me about the well at Muchgrange. 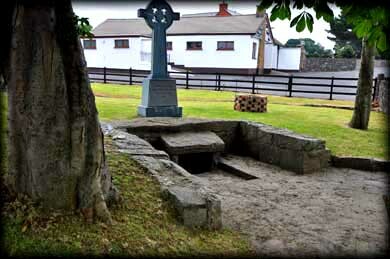 There is an enclosure marking out the site of an old graveyard, an ancient well and the foundations of a church. The well is a rectangular pool lined with large roughly dressed blocks, four or five stones high in some places and without mortar. St James is the Patron Saint of the Cooley Parish and a blessing of the graves takes place on his feast day the 25th July. St James is also the Patron Saint of pilgrims. The "Way of St James" is a popular pilgrimage to Santiago de Compostela in Galicia, where his remains are believed to be held. 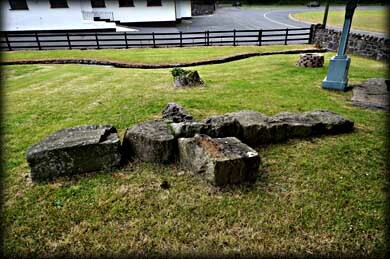 There is a strong connection with the Knights Templar on the Cooley Peninsula. 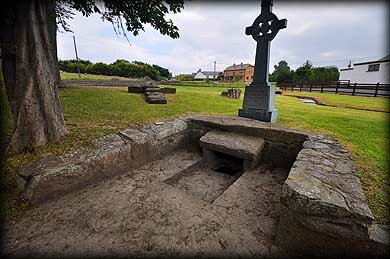 See also Lady Well, Templetown. Situated: From the M1 take the Carlingford exit and head east on the R173. After 15 kilometres turn right toward The Cooley Inn, then left. The well is on your right. Discovery Map 36: J 2161 0942. Last visit July 2013.